The Pro-Elite is very popular in the pit lanes of pretty much every cycling event or race. And this is no surprise! Thanks to its high-quality finish and light-weight construction the Pro-Elite assembles quickly and folds down to very compact dimensions. On top of that the metal clamps and the elegant red-ano aluminium tubing make it an extremely good looking work-stand. The clever clamping-system remains the strongest selling point for the Pro-Elite. The clamp jaws are simply pushed together by hand and a ratchet-mechanism locks them into place with 5 mm intervals. This is how it works: place the seat post or seat tube into the jaws, squeeze the ratchet-clamp to lock them into place and twist the knob once to tighten - job done. No other system in our test adapts as easily and quickly to the different tube sizes. Releasing the clamp gives you the same sort of satisfying feeling you get from wacking on an e-stop button: the switch located on the side of the head opens the clamp and releases the bike immediately. Conclusion: Lightweight, compact and practical. It's fast, universal and comfortable to use thanks to its 3-legged base and the ingenious clamping system. 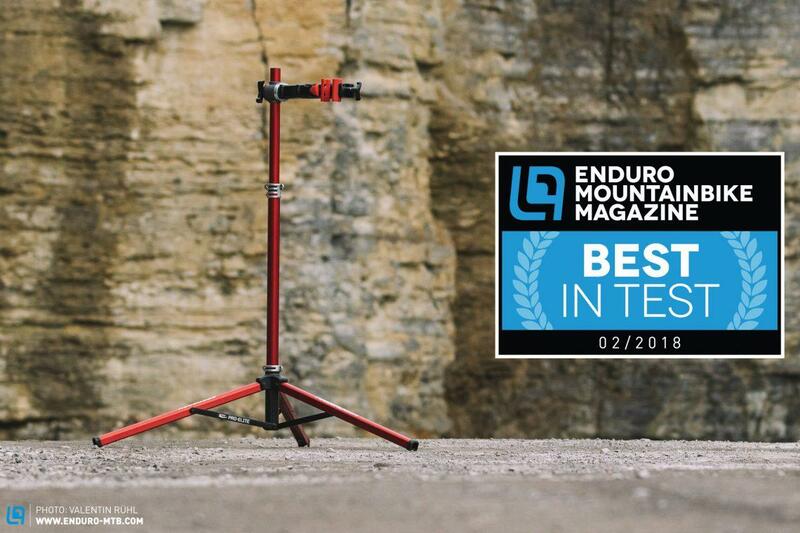 The Pro-Elite offers basically everything you can expect from a perfect repair stand - for a fair price. Our best in test! Additional information and full reviews can be found on the Enduro MTB website - here.